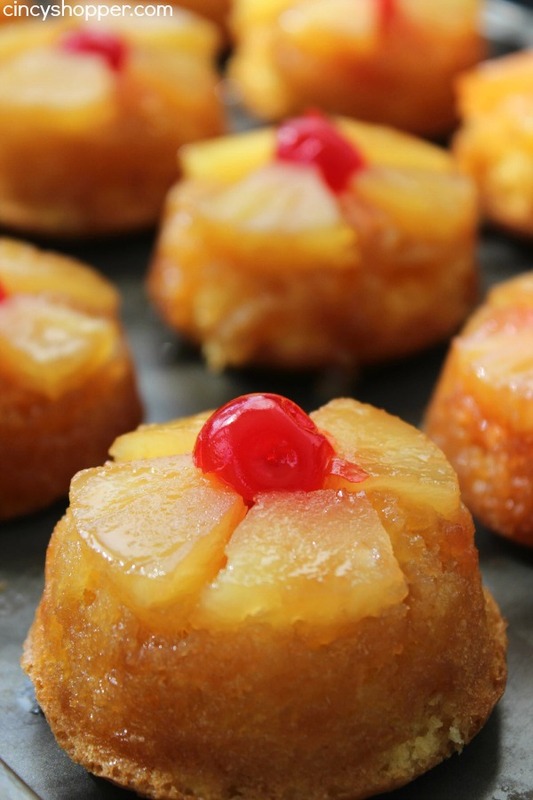 These Mini Pineapple Upside Down Cakes are perfect for serving up a yummy individual dessert. They are both super simple and super tasty. 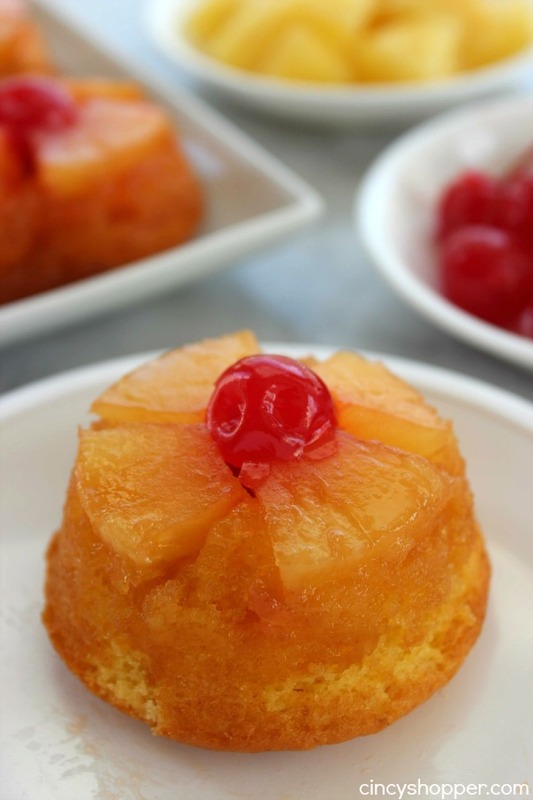 Such a fun twist on the traditional pineapple upside down cake. My hub’s favorite dessert is a pineapple upside down cake. I just now realized I have never shared a pineapple upside down cake with all of you here on my blog. I am in disbelief because the hubby will make them so frequently. I am sure that I must have had a mental block. Last week, I decided to surprise him with his favorite dessert. He was out doing some shopping so I figured it was safe to make them quickly and get the pics finished to share with you. Unfortunately, it was one of those sunshine one minute, clouds the next sort of days. I was unable to get the pictures taken before he was back from the store. As I had imagined, it was quite difficult keeping him off these little cakes. Holding him back for hours became a challenge, ha ha. 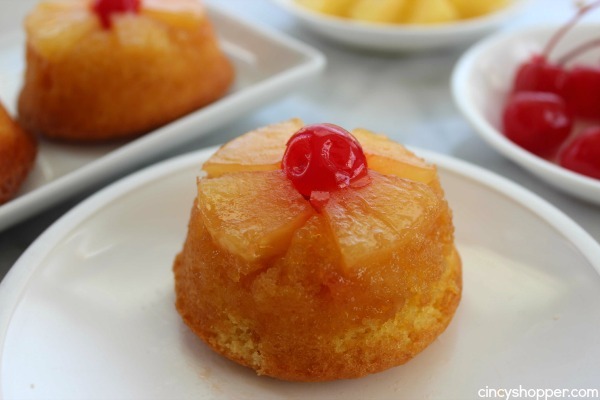 Pineapple upside down cakes are so simple. 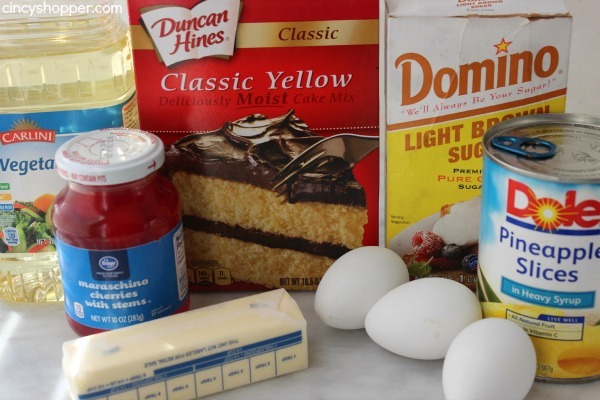 We always start our recipe with a classic yellow boxed cake mix. The brown sugar and butter bake into a gooey and slightly crusty coating that makes the cake so flavorful. 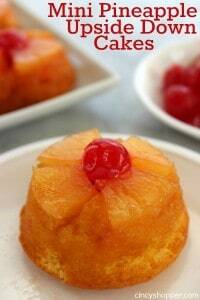 As a child, I always loved snagging all the cherries off my grandmothers pineapple upside down cakes. Looking back, that must have been so disappointing for the adults that were looking forward to the cherry on their slice of cake, ha ha. 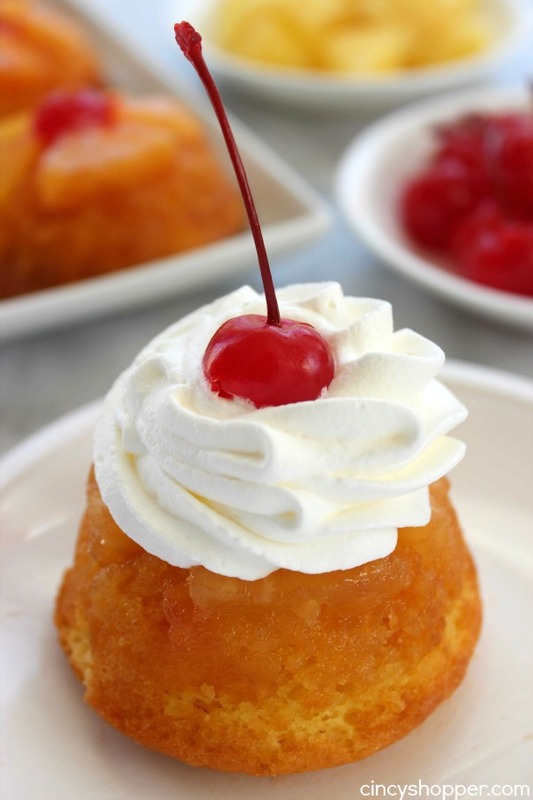 These mini pineapple upside down cakes allow everyone to get their own cherry so everyone gets to enjoy all the flavor combinations. You can even toss on some whipped cream and an additional cherry to push them over the top. 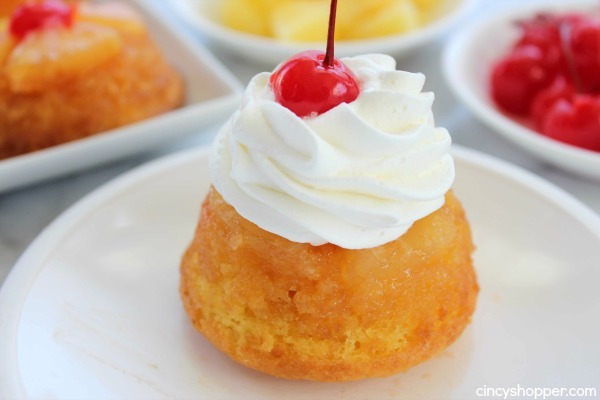 There are only a few simple ingredients needed to make a super quick batch of mini pineapple upside down cakes. You can have these miniature desserts ready in no time at all. In using pineapple rings, cut them into quarters. 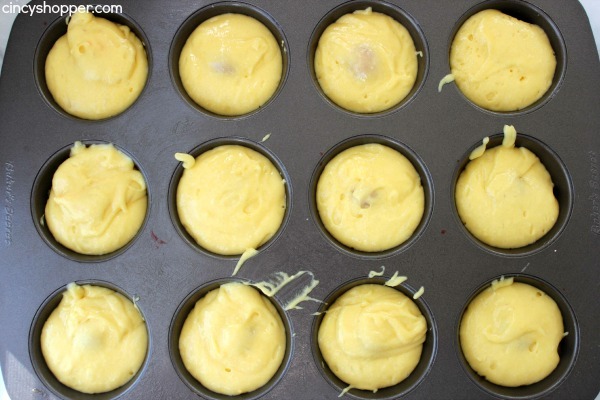 Spray muffin pan with non stick spray. 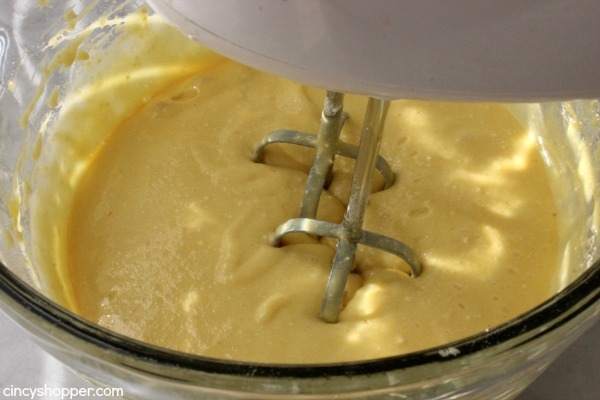 Combine cake mix, oil, eggs and pineapple juice in a bowl and beat on low until incorporated. 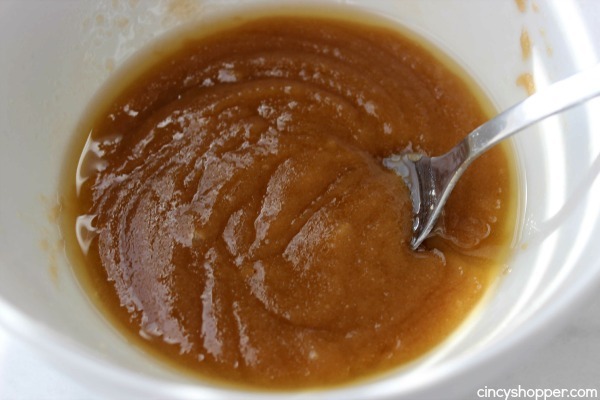 In another bowl combine melted butter and brown sugar and stir until blended. Spoon 2 teaspoons of butter mixture into each cup. 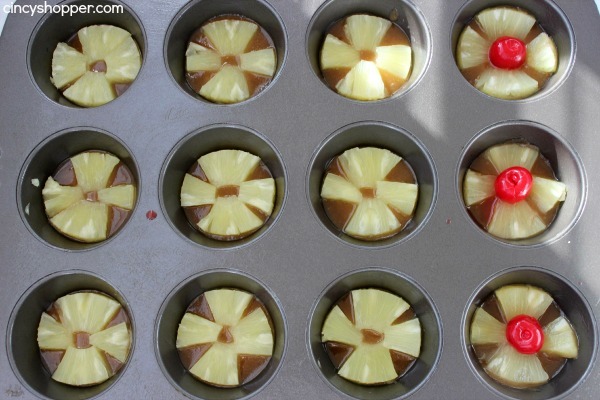 Place pineapple pieces in a circle around bottom with cherry in center. Allow to cool in pan for 5 minutes. Run a butter knife around edges of each cup and invert onto baking sheet to remove cupcakes. 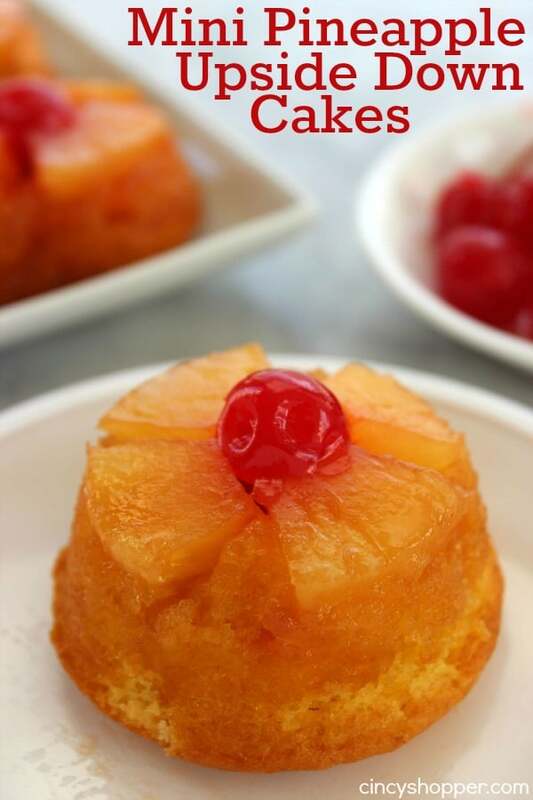 Pineapple upside down cake is great all year long but they are one of my favorite cakes during the spring and summer. Pineapple is so tropical and makes for a great addition to cakes. Mini desserts are always so popular with my family and guests. Lately, I have been on a slight obsession of making everything in mini versions. Heck, I have even been making mini versions of dinner foods like our Mini Meatloaf Cupcakes. What are your favorite cakes to make during the summer? Do you normally make full sized cakes and desserts or are you a fan of mini version desserts? Place pineapple pieces in a cirle around bottom with cherry in center. 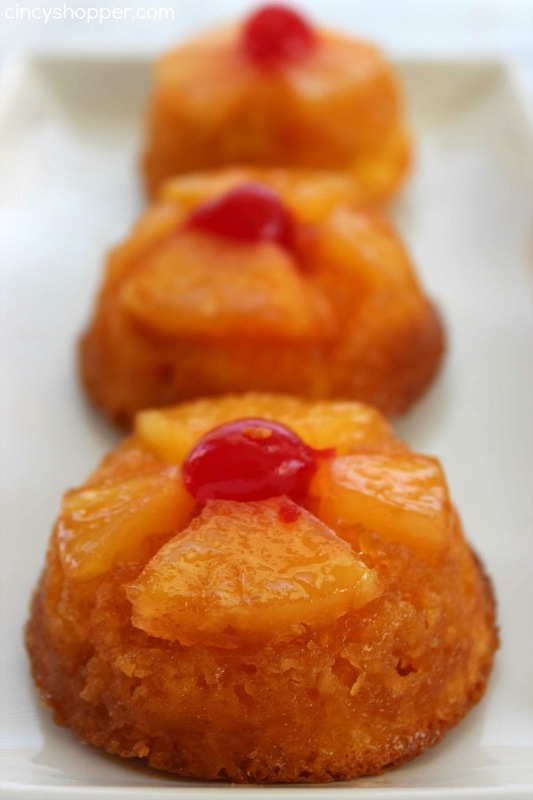 Pineapple upside down cakes are one of my favorites too. What a great idea to make a mini version. These would be perfect for our Ladies Lunch at Church. Pinning now. We would love for you to join us at Party in Your PJs, our weekly Link Party. This is the second pineapple upside down cupcake I’ve seen on the Best of the Weekend link party! It looks like the same recipe too! I think this is a sign that I NEED to make some today! Yum! Thanks for sharing the recipe! Okay, I’m convinced everything as a mini is so much cuter! Great idea! 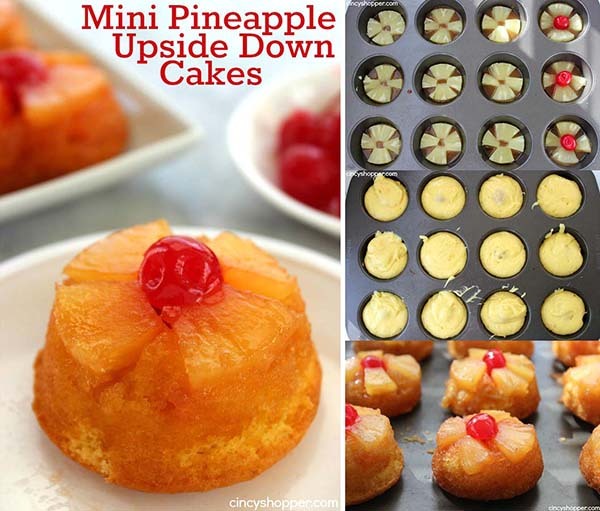 These look wonderful so I am making them right now, but I noticed that in the directions you say to mix the cake mix, oil, eggs and pineapple juice…but it doesn’t say how much pineapple juice to add. Can you help? Thank you! The recipe does not say…..
How much pineapple juice do I use? I drained pineapple chunks and used that for the 1/2 cup water. I had lots of batter left over and made a “9” single cake layer. Easy recipe but you have to work fast – but boy are these the cutest. Will probably make again. I wonder about the juice you used 1/2 cup in place of water where does it say water ?? 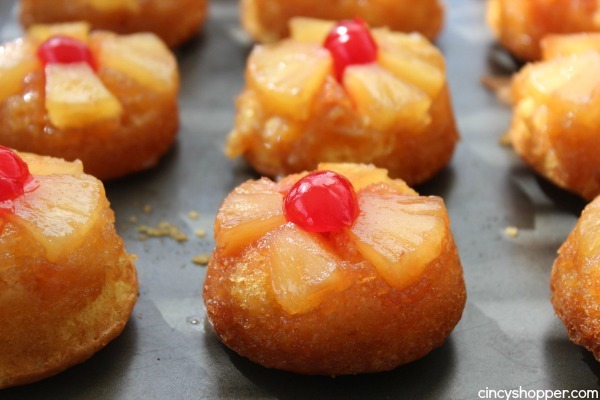 These mini pineapple upside down cakes are so cute. They look delicious too. 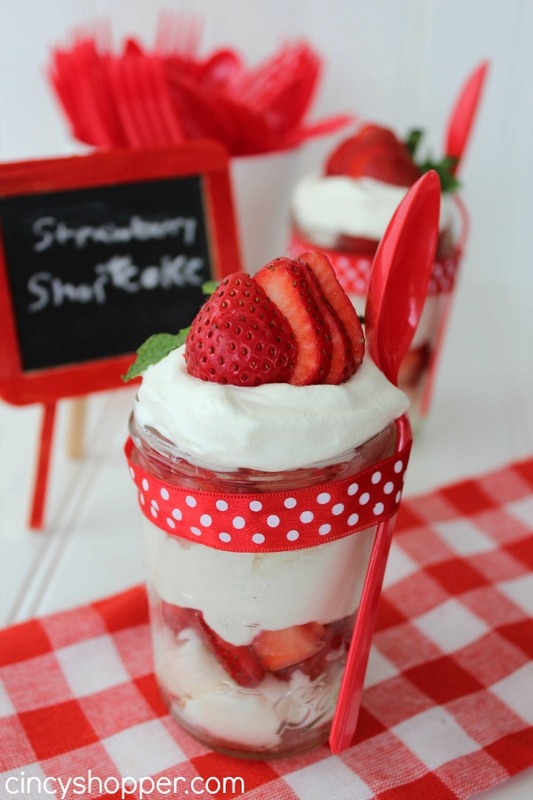 I’m so excited to try this recipe for my son’s 1st birthday party this weekend! I wanted to ask you, though, how many does your recipe yield. Is it just the basic dozen or did you have ingredients left over? I need to make 4 dozen, so I want to make sure I don’t over-shop for ingredients lol! Thanks! By any chance did you figure out how much the above recipe yields? I had the same question. Thanks in advance. Sort of…But it’s kind of confusing lol. I doubled the recipe and made 24 mini cakes, but then realized that I could make A LOT more. I was really short on time so making like, 72 would just take too long, so I used the rest of the ingredients to make 2 9″ round cakes. So you could probably make at least 36 with this recipes as it is. My husband, kids, and neighbors LOVE LOVE LOVE these adorable Pineapple Upside Down Cupcakes. The recipe make quite a few and my husband can sit down and eat them all with a quart jar of milk! My grown kids will fistfight over the last one and the neighbors buy the ingredients and ask me to make them a whole batch. Thanks so much for sharing your recipe. It is a hit in my village.